BMW M5 photographs leaked | What Car? This is the new M5, BMW's performance car that's set to go on sale in November. An M5 concept car was revealed at the Shanghai motor show in April, but these photos leaked onto the internet are of the production car. More details of the car are expected next week. What we do know is that the M5's 'high-revving' turbocharged V8 engine is expected to rise above the previous version's 500bhp, but offer improved economy and lower emissions. The engine will be mated to seven-speed dual-clutch automatic transmission as standard and will also have an engine stop-start system. 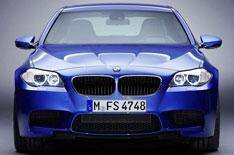 Expect the M5 to blast from 0-62mph in around 4.5 seconds and continue on to a limited top speed of 155mph. Wider wheelarches, larger air intakes, diffusers, aprons and a small rear spoiler set the car apart from the rest of the range. On sale in the UK from this November, the new M5 is likely to cost from around 75,000.